Many women experience weight gain during and after menopause, since a woman's metabolism begins to slow down around this time. “Middle aged spread” is a common phenomenon where fat accumulates around the abdomen and buttocks rather than on the hips. A healthy diet and exercise can make it possible to lose weight during and after menopause. Although it is not easy to lose weight during and after menopause, exercise, a healthy diet, and natural supplements can assist women in weight loss. Follow these tips. 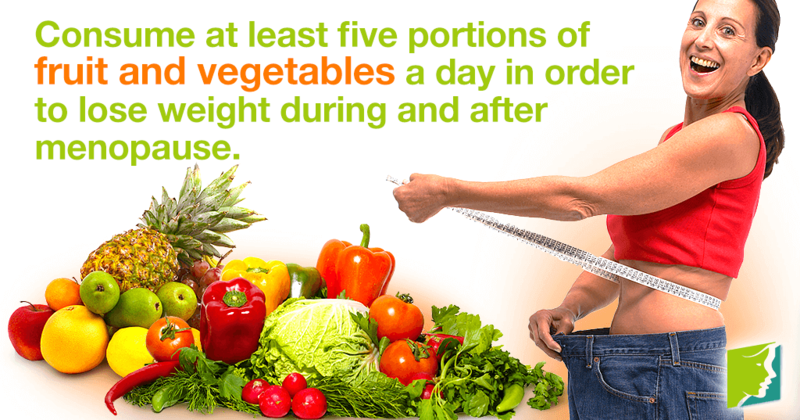 It is important that women who want to lose weight during and after menopause eat at least five servings of fruit and vegetables a day. Try to avoid processed food, which can be laden with excess calories and usually contains little nutritional benefit. It can be easy to reach for a bottle of soda when you're thirsty or to load up coffee with cream and sugar. However, these empty calories can add up. Moderation is key. Maybe try an alternative, such as unsweetened tea, sparkling water, or 100% juice. Exercising is necessary when trying to lose weight during and after menopause. Exercises such as yoga, running, walking, and swimming can help you stay healthy and can be a lot of fun. Find a routine that fits into your lifestyle and that you enjoy. Taking a natural supplement may help keep the body's systems in balance and assist women who are trying to lose weight during and after menopause. Natural supplements usually have few side effects and can help women feel more energetic and healthier. Remember to consult your doctor before taking any kind of supplement, and watch out for unverified supplements with extreme claims. It can be difficult to lose weight if you do not have the support of your friends and family. Try to find healthy meals you enjoy cooking and eating with your partner, or a workout routine you can do with a friend. It can be a challenge to stay healthy while at work, especially if you have a job where you are sedentary for long periods of time. Take a walk and stretch. Plan ahead and bring healthy snacks to work so you are not tempted to buy unhealthy food. If a woman is concerned about her weight gain and is finding she is unable to lose weight during and after menopause, she should consult a medical practitioner to discuss further treatments. Keep reading for more information about weight loss for women during perimenopause.